A walk to the end of Grassy Point today is like skipping backwards in time. Grasses grow in wetlands where Lake Superior and the St. Louis River meet, not unlike they did 200 years ago. Just over a hundred years ago, however, Grassy Point was the center of Duluth’s lumber industry, complete with chugging steam-powered mills, endless docks, clanging train cars, coal yards, and vast rafts of logs floated down the St. Louis or were pulled up river by tugboats from rivers along the northern and southern shores of Lake Superior to feed the great saws. Thousands of tons of waste—sawdust and bark slabs—that millworkers left to sink into the muck around the shores of Grassy Point have since been removed for the good of nature’s return, and a hiking trail provides hikers access to the wetlands. But just before the beginning of the trail, a lone street sign stands as a reminder of the point’s industrial past. It reads “Lesure Street” named for the lumber mill it was built to access. Clarence’s infancy in a broken home might well have been tragic, but Bertha’s second marriage undoubtedly changed his prospects with all the vastness the timberlands of Wisconsin could provide. His new stepfather, Andrew Tainter, was a New Yorker who moved to Menomonie in 1846, when the town didn’t yet have a name. He became a key partner in the Knapp-Stout Lumber Company, and eventually came to own most of the town, with controlling shares in 20 businesses and 40 buildings there. He was also a regional powerhouse, with financial interests in Barron, Chetek, Cumberland, and Spooner, where he controlled the lumber mills, banks and newspapers. At his peak, he was considered to be the richest man in the Chippewa Valley. Bertha had four more children with Tainter. Their first daughter Mabel died at age 19. The couple built the elegant Mabel Tainter Theater in Menomonie in her honor, which serves the community to this day. Some paranormal enthusiasts believe that Mabel’s ghost still haunts the building. When Clarence—often called C. J. in public records—grew up, he and his half-brother Louis Tainter joined the family business. Louis graduated from the Eastman School of Business in New York and returned to take the family share of Knapp-Stout, in charge of logging operations. Clarence went to Dubuque, Iowa, to work for Knapp-Stout as a salesman. In 1882, he backed two patents by Robert N. Nixon of Dubuque—one an oscillating gang-saw and the other an operating mechanism for the oscillating slides of gang-saws. In 1888 he built a lovely Queen Anne-style Victorian home which still stands in the historic district of Dubuque. Two years later his bride, Clara, became mistress of the house. That same year LeSure and partner J. J. Van Vliet, a fellow lumber salesman, bought a mill in Dubuque from Knapp-Stout and founded the Lesure Lumber Company. The company had lumberyards with a capacity of seven million board feet of lumber and a physical plant that covered fifteen acres. Three years later, Clara and Clarence greeted their first and only son, Coolidge. Unfortunately, tragedy disrupted the Iowa enterprise. On June 9, 1894, a huge fire that began on the Lesure Lumber Company grounds (possibly sparked by a locomotive) burned down their mill along with much of the Dubuque lumber-mill district, the largest fire in the history of Dubuque up to that time. The company rebuilt, but only in order to sell. In the meantime LeSure and Van Vliet set their sights on Duluth. Despite the financial panic of 1893, which halted many industries, the lumber business in the Zenith City was peaking. 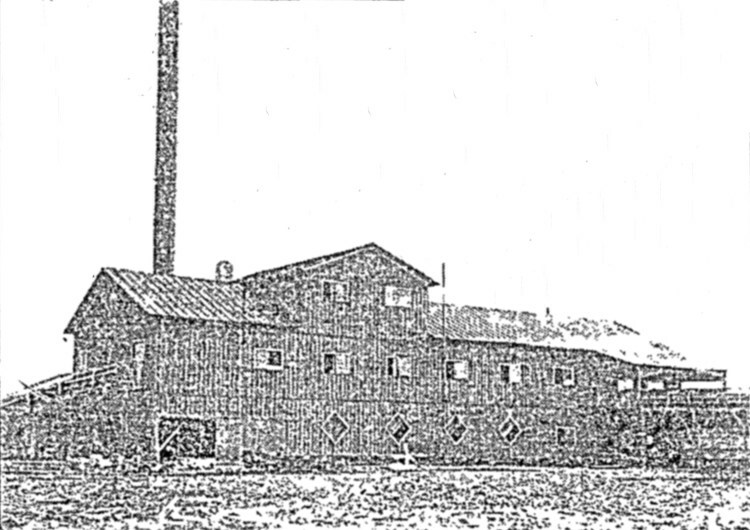 Within a year of the Dubuque fire, the Lesure Lumber Company built a mill on Duluth’s Grassy Point with a much-larger capacity. LeSure and Van Vliet moved to Duluth as well, and through their operations soon became prominent local lumbermen. Though Lesure Lumber started out as one of the biggest mills in Duluth, it was soon dwarfed by bigger capacity mills like St. Louis, Mitchell & McClure, and Merrill & Ring—all established north of Lesure Lumber on Grassy Point. Meanwhile, many other sawmills lined the St. Louis River from Rice’s Point to Indian Point. 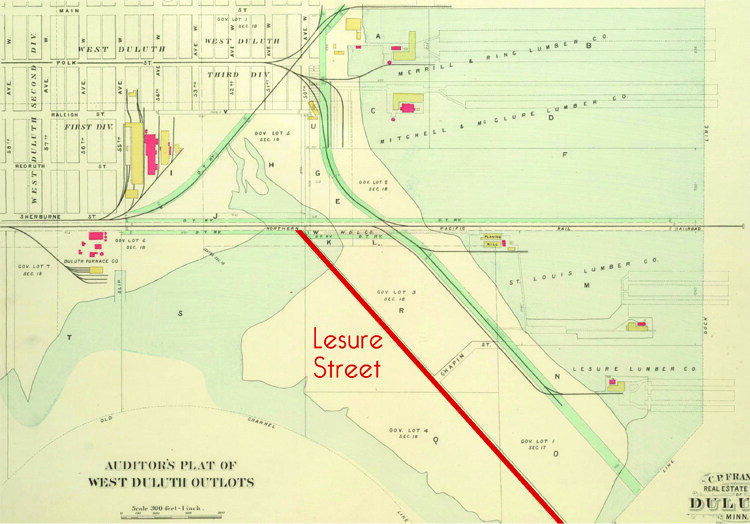 Lesure was one of at least 18 lumber mills operating in Duluth in the late 1890s. Each season local newspapers reported diligently on the mills’ operations, noting the date of each mill’s opening in April, their closings at the freeze in October, the numbers of men employed and board feet of lumber produced. During drought, newspapers reported the collective agony over logs hung up on South Shore or North Shore rivers, sometimes affecting one company more than another. Reporters and moneymen would cultivate rumors during the winter cut, speculating on how many board feet were within the logs each company would drive down the rushing rivers in the spring floods. When West Duluth’s Fourth of July parade came around, the most-anticipated floats were those of the lumber companies, pulled by huge teams of horses. In 1900, Lesure Lumber Company had a 12-horse float, while Merrill & Ring boasted a float drawn by 16 horses. Soon, union organizing became a news item as well. In May of 1901, lumber pilers at the mills struck to regain the pay they’d received the year before, having found at their first payday they’d been reduced by 25 cents per day. The mill owners bragged they’d have no trouble finding workers who wanted to work for the reduced pay. At the turn of the century, floating logs down fickle rivers began to be a thing of the past, while railroads and long logging roads chased the pines further and further back into the north woods. In the winter of 1901, Lesure Lumber had long-standing logging camps along the French River, but also was reported to have newer camps southeast of Tower and west of Biwabik. That same winter, prominent lumber experts openly predicted that the region would be logged out within five years. The end was nigh, but 1902 and 1903 numbers defied all predictions of a crash. Duluth’s 1902 cut was over 1 billion feet; 1903 surprised everyone by shattering the previous year’s record by more than 1.2 million feet. It’s unclear if the Lesure Lumber Company was having difficulty making a profit in competition with the larger mills or if LeSure and Van Vliet simply saw the writing on the wall and got out while the getting was good. In any case, the mill was rented and then sold to the Virginia & Rainy Lake Company in 1905. The new owners completely revamped the mill, with the aim of drastically increasing capacity. Though they apparently attempted to change the name of the mill, the community continued to call it the Lesure mill until it ceased operations in 1913; it burned down in 1916. Van Vliet eventually became president of Duluth Plumbing Supply. LeSure retired, and he and Clara spent much of their time traveling. They spent their winters in California. They sent their son Coolidge to Yale University; he came home to Duluth on summer breaks to play competitive tennis at Longview Tennis Club. They moved from the house they had built at 1601 East Second Street to another new house at 1712 East First Street. Clara became a matriarch of social service with the Outlook Club, the Twentieth Century Club and the Woman’s Council, where she spearheaded the funding of a free dental clinic for needy Duluth schoolchildren. They both were active in the Unitarian Church. When Clarence died in 1917, he left Coolidge as the sole heir to his million-dollar fortune. A year later, Coolidge enlisted in World War I. He was lucky enough to survive the war, marry in the midst of the Great Depression and move on to warmer climes. The lumber-mill district on Grassy Point was essentially starved to death as the logs stopped coming, and the properties were taken over by coal companies and railroads. The district narrowly escaped conflagration in 1906, but its fate is falsely tied to the Great Fire of 1918: Internet stories wrongly claim the milling district was completely destroyed during the fire. Today, rotting lumber pilings buried deep beneath the muck are all that remains of the lumber industry on Grassy Point—that and a sign that bears the name Lesure Street.